A kitchen is an important part of any home. Not only is it where food is prepared, but it is also often a space for family gatherings, conversation and fun. Because it is such a multi-functional space, it is important to keep your kitchen looking neat and clean. The space around the stove top or kitchen sink is sometimes a difficult area to keep looking good, but a gorgeous backsplash can add personality and ease of cleaning in one go. Here are our top ten beautiful backsplashes to inspire your own. Using marble as your kitchen backsplash is a subtle way to add both elegance and texture to your kitchen. Marble comes in a wide variety of colours and sizes to suit your needs. These range from small to large tiles in various shapes to pieces of solid marble cut to fit your specific kitchen. Marble has been enjoying a contemporary revival that sees it being used in slick, contemporary kitchens as well in more traditional settings. Its classic good looks rarely go out of fashion and it can be kept fresh over the years by simply updating the kitchen accessories that you use with it. Geometric patterns have been trending for a few years now, and can lend a touch of the exotic to a space. They are available in monochrome designs as well as multi-coloured patterns, so the options are endless. When using a busy pattern, it may be necessary to tone things down around the backsplash so that it doesn’t become overwhelming. While traditionally they were applied to literally look like fish-scales, a Moroccan fish scale tile is a versatile tile that allows for a variety of patterns to be created, depending on how the tile is laid. These tiles create an intriguing effect, adding a feeling of playfulness to the kitchen space. Available in a wide variety of colours, the pattern can be subtle or vibrant and colourful. Exposed brick is incredibly versatile and can be used to complement anything from a traditional to a modern kitchen. 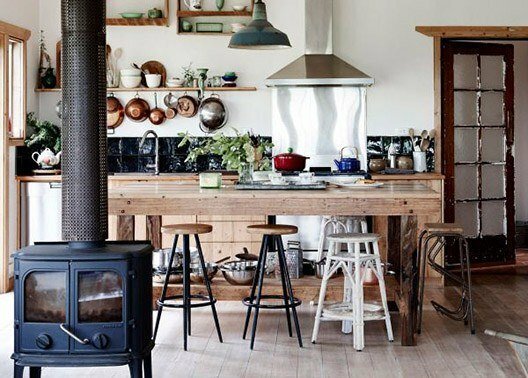 Many different looks can be achieved using bricks: when coupled with warm wood and baskets you can achieve an effortless rustic or farmhouse look, but by combining it with cool metals and exposed pipework, you’ll create an industrial space. Use a bold pattern to draw attention to your backsplash. A black and white pattern with lots of contrast creates a beautiful feature, while still allowing the colours of the kitchen to be updated easily by changing small, removable items on the counter or shelf space. Hexagon tiles, creating a beehive effect, make a beautiful backsplash. The colour of the grouting, either matching or contrasting, will influence how much the pattern stands out. These backsplashes create a feeling of order and organization and compliment a minimalist kitchen well. While wood is not often used as a backsplash for hygiene reasons, the wooden effect can still be achieved by using wood-look tiles. This can then be accentuated with wooden features like shelves or utensil holders. While backsplashes should be beautiful, they should also be practical. Throw in an additional practical element by using it as storage space for those items you always use at the stove. A mini shelf built into the wall, hanging shelf or wire grid all make for easy ways to keep the things you need often, close by. Not all backsplashes need to be neutral colours. Using a colourful tile that either complements the colour of your kitchen, or that acts as the accent colour in your kitchen, is a great idea. Colour helps to brighten the room and highlights a focal area. The classic subway tile look has become popular in recent years. Subway tiles can be arranged in many ways with the most popular being in a herringbone pattern or horizontally, with each row offset from the row above. A backsplash is a perfect opportunity to add some texture, colour or pattern to your kitchen. Remember to keep in mind the practical aspects of your own kitchen design, while bringing out your personality and style.